George Barris was still living in Sacramento, spending his spare time in Harry Westergard’s shop, when he build this 1936 Ford convertible as his very own Personal Every Daily Driver. Many interesting things are shown in these early photos. For instance, the modification of the filled-in area on the doors, just above the belt line. We can see that George had it filled on his Ford, while Garrett’s doors were still stock when these photos were taken in 1943. Eventually, Westergard would fill in this body crease on Garrett’s Ford as well. It is an odd, perhaps not really improving custom touch, but it sure is interesting to see that George did this modification on his car first. 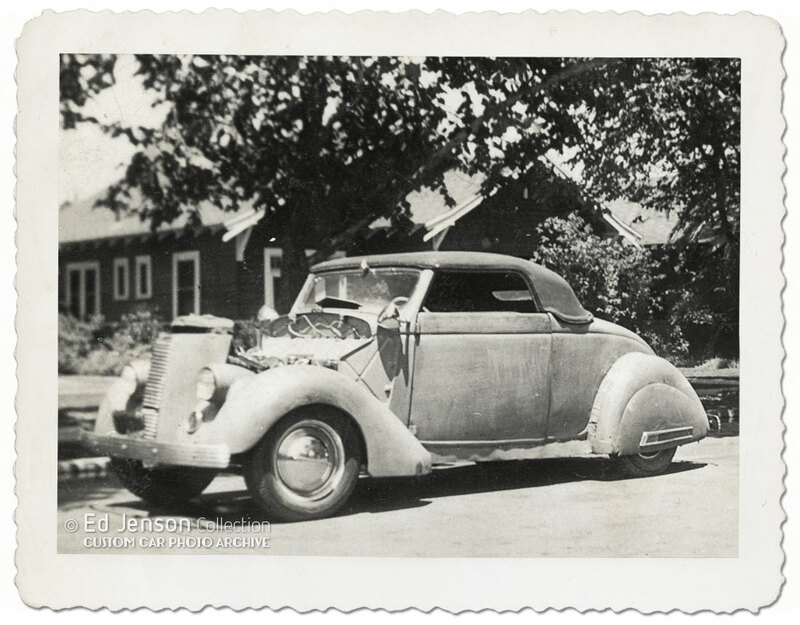 Was Harry influenced by Georges design on his own 1936 Ford? Or did they work together on the cars, and experimented the team on George his car first? I do not know if we will ever find the answer to this. Harry is long gone, and George already mixed up the Gene Garrett 1936 Ford and his own 1936 Ford in one of his own books. 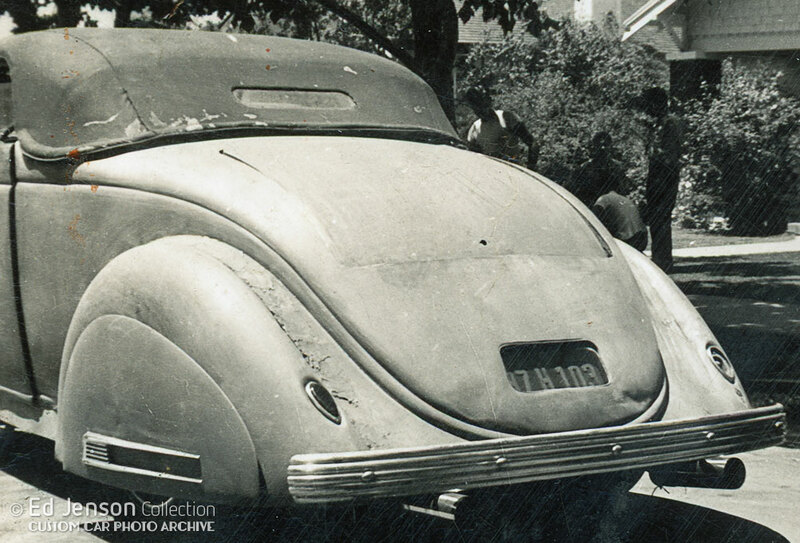 This photo taken in 1943 shows George’s ’36 Ford still in progress in Sacramento Nor-Cal. Parked behind it on the far right of the photo we can see the front end of the in progress Gene Garrett’s 1936 Ford created by Harry Westergard. George built his 1936 Ford cabriolet not only for personal use, but also as a rolling advertisement of his skills as custom car builder. 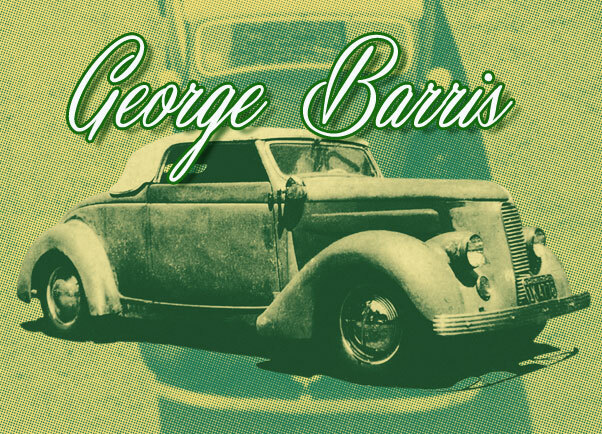 According to some of the Barris books, George built this car when he was working at Brown Brothers in Sacramento. During this period he spent much of his spare time at Harry Westergard’s shop. Ed’s photos of Georges car, show the car is still rather rough, but most of the work has already been done on it. George removed the running boards, and filled, and reshaped the back of the front fenders. He chopped the windshield, and used a padded top. According George had Hall Tops out of Oakland create the top for him. But in these 1943 photos, we can see that the top already looks rather old and used. So we are unsure if this is the Hall top he is referring to, or that this one is an older used top he bought somewhere. 1939 Ford taillights were slightly recessed into the rear fenders, another unusual feature on George his car that we have not seen done very often in the 1940’s. The license plate was recessed, and placed behind glass on the lower body panel below the trunk. He molded in headlight buckets, low into the front fenders. The headlights on Georges car are a lot lower, and closer to the grille than what Harry Westergard did on Gene’s Ford. George used a 1939 Nash grille to make the front look taller, and more elegant. George used, just as Harry did on Gene’s Ford, 1934 Pontiac hood sides and tear drop shaped fender skirts with Buick trim pieces. George used Appleton spotlights, ripple disk hubcaps and 1937 DeSoto Bumpers. Cropped detail of one of Ed Jenson’s photos shows the rough body on George’s Ford. 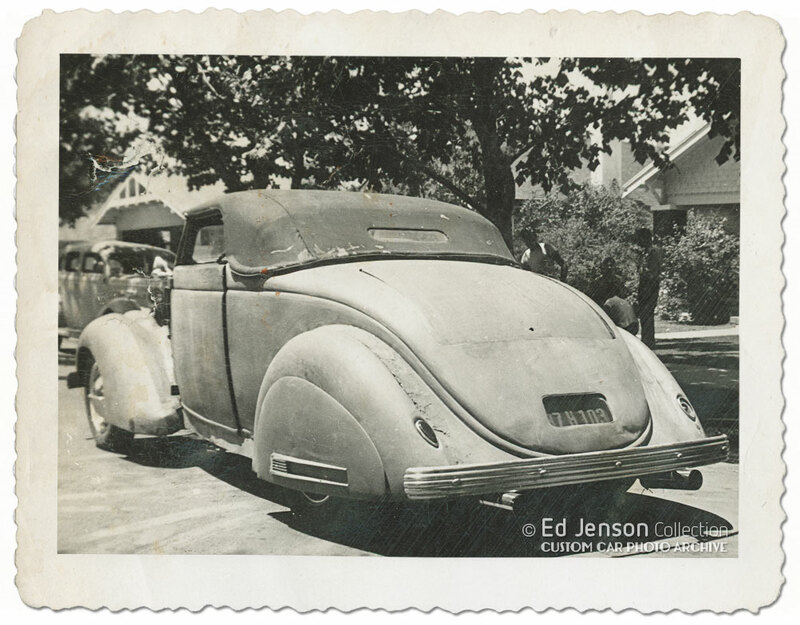 This photo gives us a good look at the frenched 1939 Ford taillights, the set-in license plate as well as the well worn dark colored padded top and double exhaust with large diameter tips. It looks like George had driven his chopped Ford for some time already, judging by the wear and tear on the Hall top. It also looks like George had applied some heavy amounts of lead when molding the rear fenders to the body, and had not filed and sanded the lead yet. The recessed 1939 Ford taillights – of which one is broken – are a nice touch. In this slightly fuzzy photo we can see George ran his car without the hood and hood sides that day. Perhaps they were not finished yet. We can also see the molded in longer than stock headlights, the reshaped back portion of the rear fenders, the very wavy frame rail cover, and the filled in body crease on the door, above the beltline. 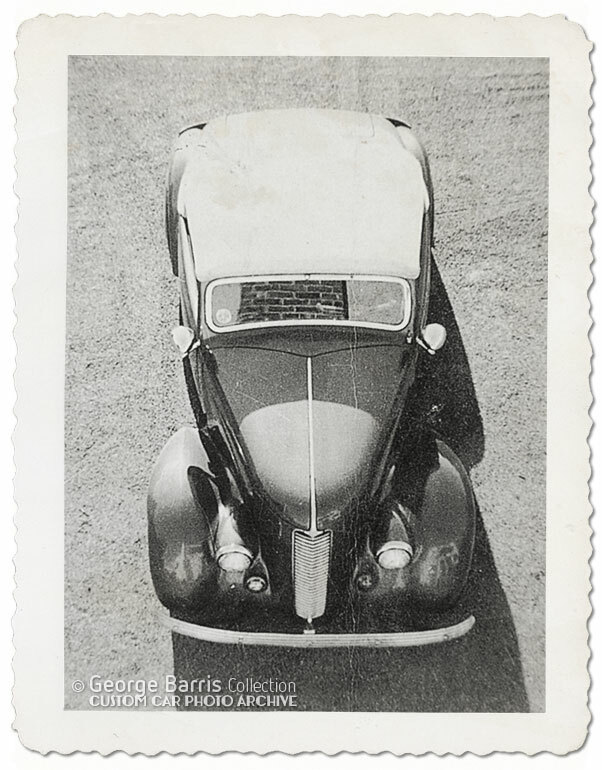 In the May 1953 issue of Hop Up magazine, was an article on the Barris Shop. 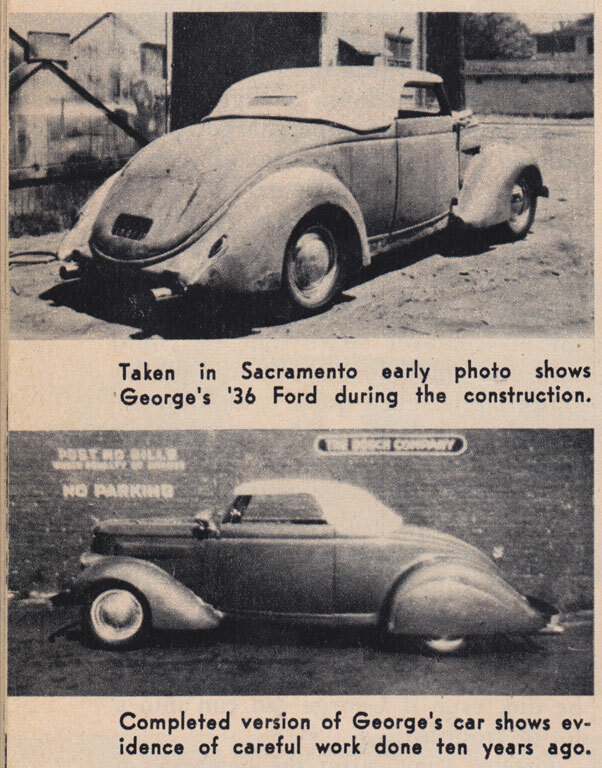 In this article two photos of Georges personal 1936 Ford were used. One unfinished without rear bumpers and fender skirts, and once complete finished and painted. 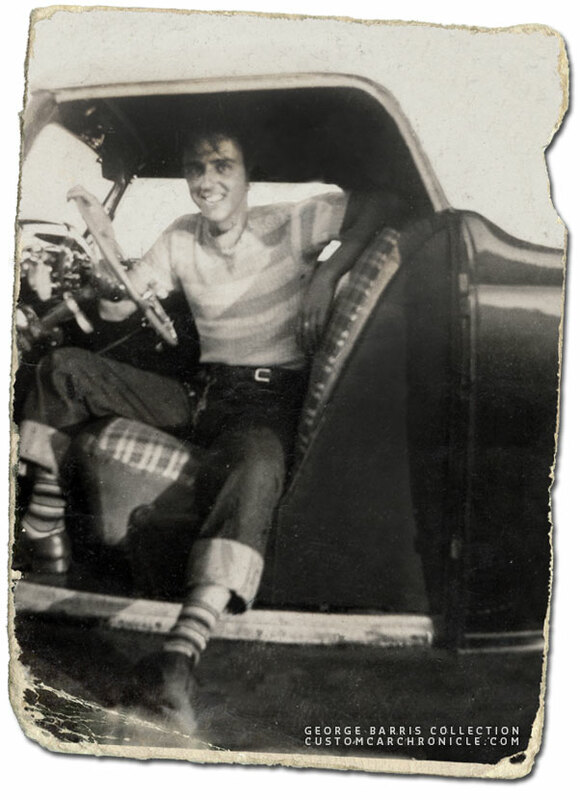 A very young George Barris in his recently finished 1936 Ford. The photo was take after George had driven the car from Sacramento to Los Angeles during WWII. One other photo of Georges 1936 Ford as a finished car was taken from a building top, for an interesting birds-eye point of view. It shows the nice lines the molded in longer headlights create. After Ed took the photos of the unfinished car, George continued to work on it. Eventually, when all the work was fine-tuned, he painted it with many coats of medium blue lacquer. 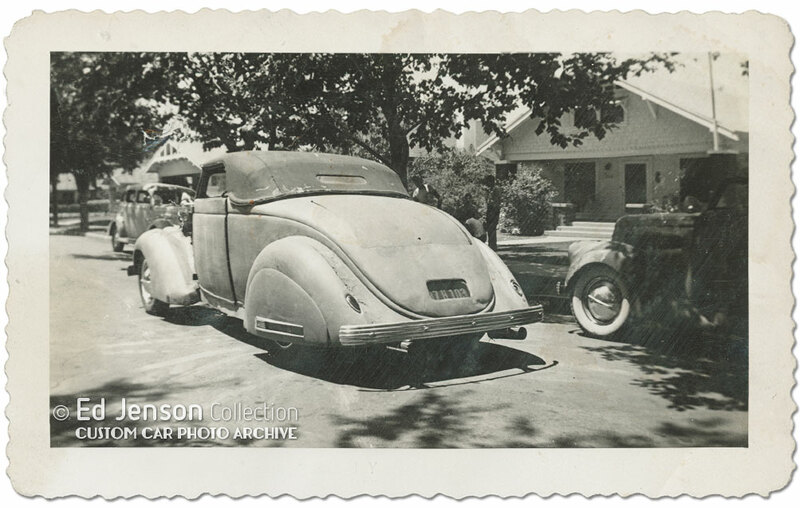 This 1936 Ford, was the car that George drove when he moved to Los Angeles in 1944. It is also the car he used to impress many guys and girls with, because of the door electric poppers he had installed to open the doors. At the time he was one of the first to use these. Most other cars that had the door handles shave off, had to be opened by hidden handles, or through the open windows on the inside. George damaged the front end of this Ford in an accident. 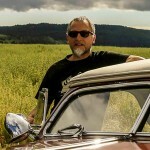 He took a job at the Jones Brothers body shop in LA, and made a deal that he could used the shop tools and space to fix his own 36 Ford, in exchange of doing shop work for them. George remained with this shop for some time, and brought in new custom orientated clients to the shop. Later George sold the 1936 Ford in LA, and never saw it again. The in-progress photos of George Barris’s and Gene Garrett’s 1936 Fords are of great historical importance. 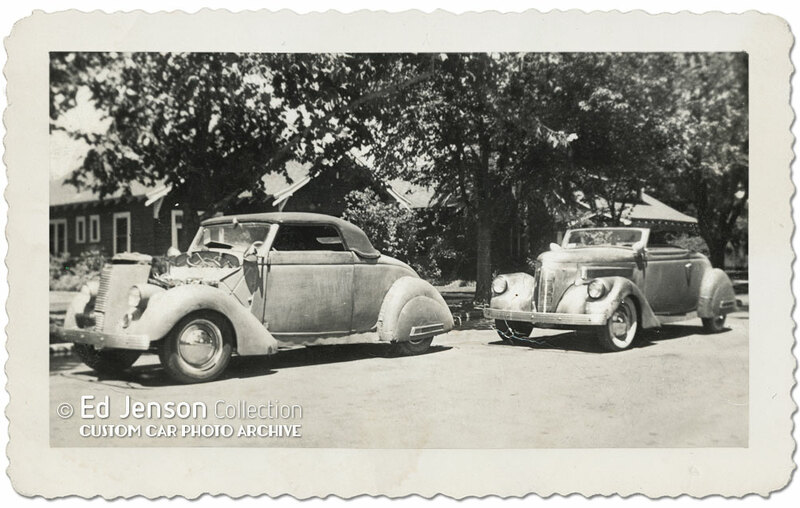 Over the years, both cars have been mixed up in several publications – especially the Westergard Gene Garrett Ford (on the right in the photo below) is often misleadingly “identified” as the George Barris 1936 Ford. This photo shows that Harry Westergard, and George Barris were working on similar styled cars at the same time in the early 1940’s. They both worked together during that period, and we can state that this collaboration must have influenced both in creating their own distinctive custom car style. More on the Gene Garrett Westergard restyled 1936 Ford can be found in this CCC-Article. This 1943 photo, shows George Barris­’ 1936 Ford on the left, and Gene Garrett’s Westergard­ built Ford on the right. Thanks for this long awaited article !